The Annual Tower of Excellence Awards Dinner for the Corporate Housing Providers Association was held in Miami Wednesday evening March 7, 2012 and Gables Corporate Accommodations won the top honor being named Company of the Year for companies with more than 300 units. The judging criteria included contributions locally, nationally and internationally to the corporate housing industry, exceeding guests’ expectations, creating unique solutions and programs that enhance the industry as well as collaboration and developing strong relationships with suppliers and corporate home providers. David Fitch, Gables Residential Chief Executive Officer, said, "Our corporate accommodations division is most deserving of this award. In the recent challenging economic climate GCA continued to remain profitable and now is experiencing significant growth while still receiving high marks from our clients for its customer service. Providing furnished apartment units nationally is an important complement to managing our own apartment communities and adds value for the owners of our fee-managed communities as well." 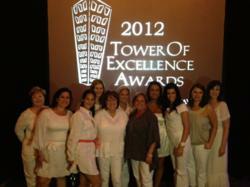 Pam Wade, Vice President of Gables Corporate Accommodations and her team were in attendance to receive the award. “This is a huge accomplishment and we are extremely honored”, noted Wade. “A large part of our success is due to our associates and their tireless commitment to provide quality service and foster mutually rewarding relationships.” Gables Corporate Accommodations competed with well-known and respected companies in the industry, including Marriott ExecuStay. GCA now joins Oakwood and BridgeStreet as the only companies in CHPA history to have received this pinnacle award twice (GCA also won in 2003). Gables Corporate Accommodations is a division of Gables Residential specializing in providing furnished corporate housing nationwide. Offering a range of housing solutions for one to one hundred to an entire corporation, GCA specializes in delivering comfortable and efficient solutions for furnished housing. GCA combines cost-effective ideas, personal service and the simplicity of their “One Point of Contact” program. To discover more about GCA and living solutions that meet your needs, please visit http://www.gcarent.com or call 866-422-7368.